Ulster Architectural Heritage is the trading name for The Ulster Architectural Heritage Society; a charity registered in Northern Ireland (NI Charity Commission No: NIC101510, Company Reg. No. 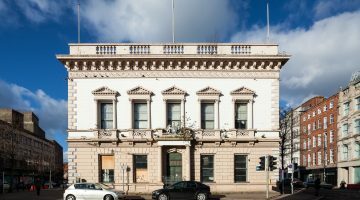 NI 35582), Registered office: The Old Museum Building, 7 College Square North, Belfast, BT1 6AR. On applying to become a Member of Ulster Architectural Heritage you are automatically agreeing to these terms and conditions and you are providing us with the appropriate consent to handle your personal information in accordance with data protection laws and our data protection policies. References to the “UAHS”, “we” or “us” are references to Ulster Architectural Heritage. 15% discount on bookings with the Irish Landmark Trust. 1 free presentation by UAHS, as agreed, to staff of corporate members only. 1 free listing for yourself, your partnership or your company on the traditional skills register, for corporate and trade members practising or specialising in traditional skills only. By becoming a member you automatically agree to being contacted by email and/or post with information regarding to events, news or offers from UAHS. You may opt out of this at any time by contacting the office or following the link at the bottom of our emails. We do not share your email address with any third parties. 1.2 We reserve the right to change the benefits that apply to UAHS Membership at any time and without prior notice. Where possible, changes to benefits will be published on the UAHS website. 1.3 We may maintain, cancel or introduce different categories of membership from time to time. It is your responsibility to ensure that you have the most appropriate category of Membership to suit your personal circumstances at any time. The UAHS is not responsible in the event that a more appropriate category of membership may have been available at any time. 1.4 From time to time Members may be able to benefit from reciprocal entry arrangements or offers with bodies with similar charitable aims and purposes to the UAHS but these arrangements cannot be guaranteed. 1.5 Members should remember to bring their Membership card with them when they visit us or any sites where discounted entry or another offer is made available to members of the UAHS by one of our partners. Entry may not be allowed without your Membership card. 1.6 Membership cards are for the named card holder(s) only. Membership may not be transferred to another person and Members are not permitted to allow another person to use their Membership card. 1.7 ‘Single Membership, Student Membership and Life Membership’ categories allow only the named card holder to receive the benefits of our Membership. ‘Joint Membership and Joint Life Membership’ categories allow both named card holders to receive the benefits of our Membership together or individually. 1.8 Corporate or Trade Membership does not represent an endorsement of that organisation by the UAHS, nor does it represent accreditation of that organisation or individuals within that organisation. By becoming a member of the UAHS it does not permit the Corporate or Trade Member to use any logo representing the UAHS in their work, or to state or imply endorsement of their organisation or individuals within that organisation by the UAHS in any communications. Corporate Membership allows all individuals within their organisation to avail of the benefits ascribed above, when presenting a valid Corporate Membership card. Additional copies of the membership card are available upon request. Trade membership applies only to individual practitioners or a business of 2 employees. 1.9 UAHS Membership (other than Life Membership) is valid from the date of acceptance by the UAHS for one year. 1.10 Membership cards and packs will be delivered within 30 days of your Membership payment being processed by the UAHS. 1.11 Lost Membership cards will be replaced upon request. 1.12 Although we will endeavour to adhere to advertised office opening hours we reserve the right to change opening hours or close at short notice for safety, private hire, or any other reason. Please phone ahead before visiting the UAHS office. We reserve the right to restrict entry or to demand that any member leave a property for reasons of health or safety or if we consider that it is in the best interests of the UAHS or our staff, volunteers, or other visitors. 1.13 Membership may not entitle Members to attend special events, tours or take part in other activities run by the UAHS which require additional payment, or are specially scheduled for another organisation or group. 3.1 The UAHS reserves the right to refuse any application for Membership. UAHS also reserves the right not to fulfil or to cancel a Membership if you (or the Member, where you purchase Gift Membership for another person) are found to be in breach of these conditions. 3.2 On receipt of your order we will debit your card or process the Direct Debit payment or process your cheque for the price (as applicable). However our acceptance of your offer remains subject to approval of it by us. Once a decision has been reached we will either confirm that your application has been accepted, at which point a contract will be formed between us, or notify you that we cannot accept your application. If we cannot accept your application for whatever reason we will confirm that your account has been re-credited (if applicable). 3.3 If we are unable to obtain payment authorisation from the issuer of your card or from your bank in the case of Direct Debit payments and a Membership has already been issued to you, we will request you return the card and you will forfeit any benefits. 4.1 All quoted Membership fees are for a one-year Membership subscription or a Life Membership subscription (as applicable). 4.2 We reserve the right to increase the price of your Membership subscription. You will be informed of any fee increase within your renewal letter. 5.1 The credit/debit card information you provide us for a Membership transaction is used solely for the purpose of processing that Membership transaction. If we are unable to process payment from the credit/debit card details you have provided we will contact you immediately to verify your card details. 5.2 We strongly advise you against sending us any credit/debit card information via email. It is contrary to the rules of the Payment Card Industry (PCI) for us to accept credit/debit card payments by email and we will decline to accept payment by this means. 5.3 If you are not using your own credit/debit card to pay for the Membership subscription, you must ask permission of the credit/debit card holder before entering payment details. When you subscribe to Membership of the UAHS either online, by post or verbally, you are confirming that you have obtained the express prior permission of the credit/debit card holder. 6.1 UAHS takes Direct Debit payments every quarter: 31st March, 30th June, 30th September and 31st December. If paying by Direct Debit, your first payment will be taken on the next available date. 6.2 If there are any changes to the amount, date or frequency of your Direct Debit, the UAHS will notify you 10 working days in advance of your account being debited or as otherwise agreed. If we request to collect a payment, confirmation of the amount and date will be given to you at the time of the request. 6.3 If an error has been made in the payment of your Direct Debit by us or your bank/building society, you are entitled to a full and immediate refund of the amount paid from your bank or building society. If you receive a refund you are not entitled to, you must pay it back when requested to do so by the UAHS. 6.4 You can cancel a Direct Debit any time by simply contacting your bank or building society. Written confirmation may be required. We would be grateful if you also notified us using the contact methods set out below. 7.1 As a consumer, you have a legal right to cancel the contract formed between us (and receive a refund of the fees paid) if you change your mind or decide for any other reason that you do not want to continue the Membership. 7.2 Your legal right to cancel the contract starts from the date on which we confirm that your application for Membership has been accepted, which is when the contract between us is formed. Your deadline for cancelling the contract is 14 days after the day on which this contract was formed. 7.3 To cancel a contract, you just need to let us know that you have decided to cancel. Please telephone us on 02890550213, email [email protected] or write to us at Ulster Architectural Heritage, The Old Museum Building, 7 College Square North, Belfast, BT1 6AR. 7.4.2 make any refunds due to you as soon as possible. 7.5 If you pay for your Membership in full in advance then you may not cancel the Membership or receive any refund except in accordance with Clause 7.2. 7.6 In the event that your Membership is cancelled for any reason you must return your membership card to us and you will no longer be entitled to receive any Membership benefits. 7.7 Membership rights and benefits shall cease on death but no refund shall be made. 8.1 Gift Membership can only be used by the named card holder or card holders (subject always to the terms of the specific category of Membership purchased). 8.2 The purchaser of any Gift Membership warrants that he/she has the consent of the member to provide the member’s personal data to the UAHS for the purposes of administering the membership and membership benefits. 10.1 Subject to clause 10.3, and to the extent possible by law, UAHS excludes all liability to Members or to any other third party for any loss of profit, or any special, incidental or consequential damages (however arising, including negligence) arising out of, or in connection with services, benefits and/or products supplied by the UAHS or any company associated with the UAHS. 10.2 Subject to clause 10.3, the liability of the UAHS to you is limited to the amount of your Membership fee. 10.3 Nothing in these terms and conditions excludes liability for death or personal injury caused by the UAHS’s negligence or for fraud or fraudulent misrepresentation. Office hours are Monday to Friday 9.15am to 5pm (excluding the period between Christmas and 2nd January, and Bank Holidays). These terms and conditions are governed by the laws of Northern Ireland. Anything said by any sales person or member of our staff on our behalf should not be understood as a variation of these terms and conditions, nor as a representation about the nature and quality of the services being offered by us.